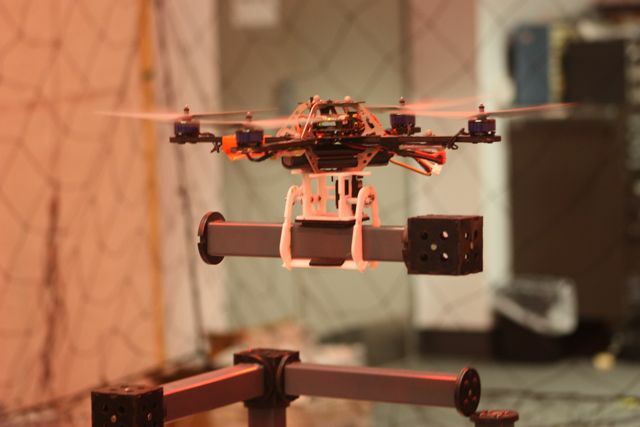 Meet the quadrotor, a four-propeller helicopter-style creature that lately has been whizzing around Penn’s GRASP robotics lab with increasing sophistication. A propeller on each corner gives it a shocking degree of agility and speed. And to their already impressive repertoire of individual tricks, the quadrotors (or more properly, their creators at GRASP) have added another feature: teamwork. Daniel Mellinger, a PhD student who’s been involved with the quadrotors since December ’09, describes their increasing dexterity like a proud parent. First, he says, the quadrotors had to be taught the rudiments of movement: “the basic ability to fly where you want, and hover in space very accurately, fly along trajectories, that sort of thing.” Then they branched out into more gymnastic tricks, like zipping straight up and flipping end over end in seeming free fall, before catching themselves at the last moment and resuming a perfect hover just before hitting the ground. In the video above, the quadrotors could be Olympic divers going off the high board, twisting impossibly though the air until they hit the water with barely a splash. They also show off a few moves that recall our finest Sci-Fi chase scenes. Watch them dart sideways through narrow openings, and imagine Han Solo turning the Millenium Falcon sideways to slip through the landing-bay doors milliseconds before they slam shut. Once they’d achieved solo acrobatic brilliance, Mellinger says, the next step was getting the quadrotors to work in teams: “Once you have that capability, it really opens up some doors.” For example, they fashioned a gripper attached to the bottom of the copter that transforms it from daredevil to construction robot. The copters are just as careful when fitting the pieces into place. The beams are magnetized and more or less snap together on their own, but they still have to be placed with precision. Before letting go, the copter exerts a little twist to make sure it encounters some resistance, and the beam isn’t just swinging free. “If it’s not right, [the copter] keeps on trying until it is,” says Mellinger. The move is familiar to anyone who’s ever screwed together an IKEA table and jiggled the legs to make sure they’re firmly in place. The most remarkable thing about the construction process is how little human interaction it requires (there’s no one hiding in the background of this video with a joystick). “We tell them the structure we want to be built, so for example a five-cube tall tower, or a pyramid.” The copters take it from there using “an algorithm that automatically figures out the part plan—which parts go where, in what order. And then the quadrotors take that plan and execute it.” It’s as if the humans say here’s what I’d like you to build, the parts are over there, and…Go. And the robots take it from there.